FreedomPop is a wireless internet and virtual network company that provides "free" mobile services such as data and text. Like with many online wireless companies, customers have questions and complaints about problems they've encountered. We have compiled consumers’ top questions to FreedomPop on Pissed Consumer like how to contact FreedomPop customer support, how to stop the Freedom app from using so much mobile data, to upgrade or downgrade my FreedomPop.com account and provided answers to them. How do I contact FreedomPop customer service? Why am I still being charged after I canceled my plan? Why am I being charged when I am on the "free" plan? How do I stop apps from draining the battery on my phone? How do I stop the Freedom app from using so much mobile data when I’m connected to WiFi? How do I upgrade or downgrade my FreedomPop.com account, and can I downgrade for free? What phones work with FreedomPop? How much free data I’m allowed on FreedomPop, and what happens once I go over that amount? The majority of FreedomPop complaints on PissedConsumer.com have to do with contacting customer service, billing issues, and refunds. We hope the following information can help consumers who are facing problems with the company. 1. How do I contact FreedomPop customer service? 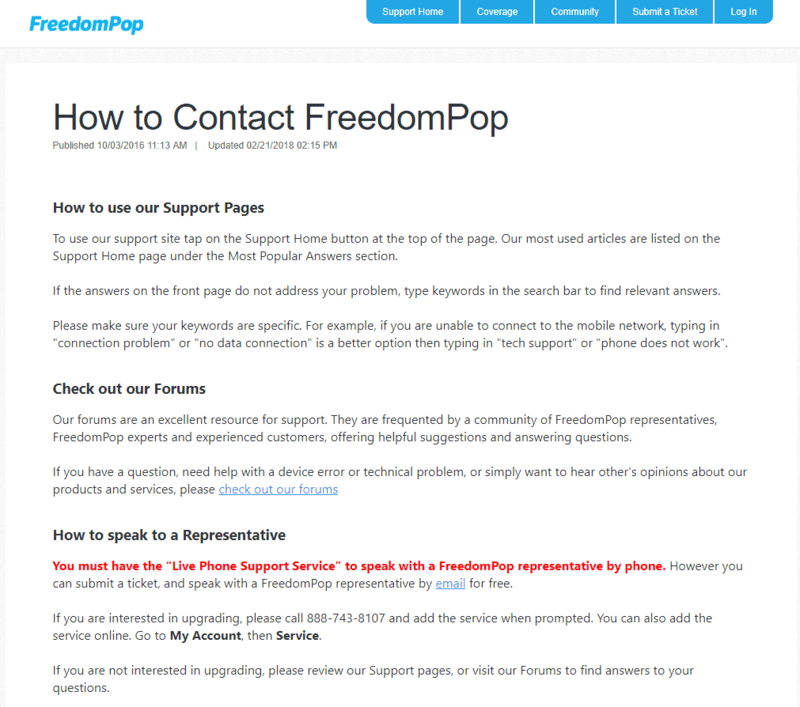 According to FreedomPop’s FAQ, there are several ways customers can get help. One way is to use the company’s support pages, which provide answers to many FreedomPop customer questions. 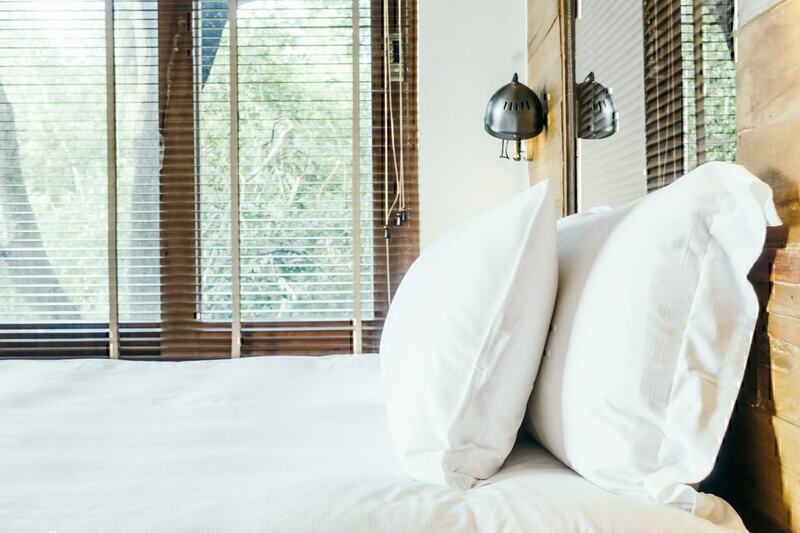 The company also has forums, in which people can ask questions as well as see how other customer complaints were resolved. Customers can also contact FreedomPop customer service by toll-free phone number for free or by email. For questions regarding terms and services, customers may also call FreedomPop's customer care number 1 (888) 743-8107 or they can write the company at FreedomPop, 1100 Glendon Ave. Suite 700, Los Angeles, CA 90024. 2. How do I get a refund from FreedomPop.com? 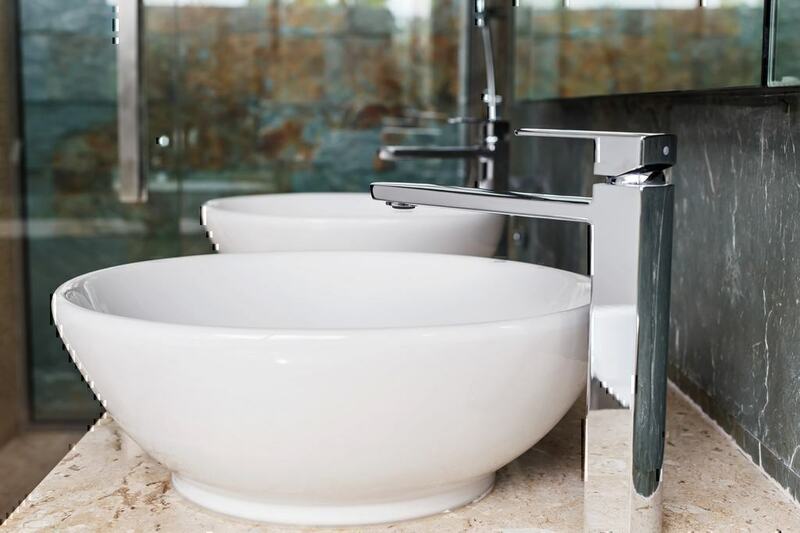 According to the company's terms, customers can get refunds for any incorrect amounts paid by customers if they have not already used the service for which they are seeking a refund. FreedomPop also offers refunds on equipment that is in "like-new" condition. Customers can complete a Return Material Authorization within 14 days after the RMA has been issued to request refunds. Refunds will only be issued to the person whose name appears on the receipt. The company also refunds deposits on leased equipment. According to FreedomPop's terms, the company does not refund any service if customers cancel subscriptions. 3. Why am I still being charged after I canceled my FreedomPop.com plan? 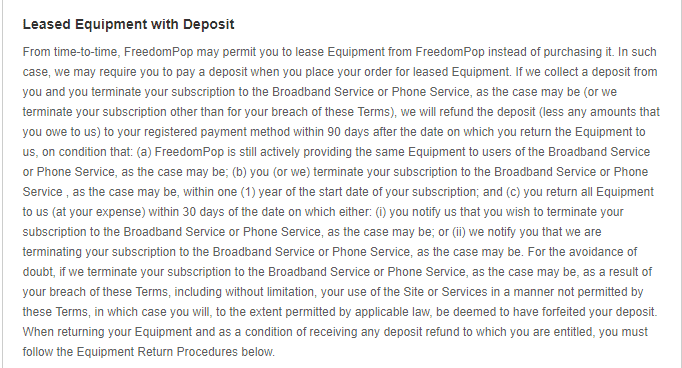 According to FreedomPop's terms of service, if customers terminate or downgrade their subscriptions before the end of their term agreement, they will not be refunded. In addition, the company claims that customers could be charged FreedomPop administrative fees plus any applicable taxes. 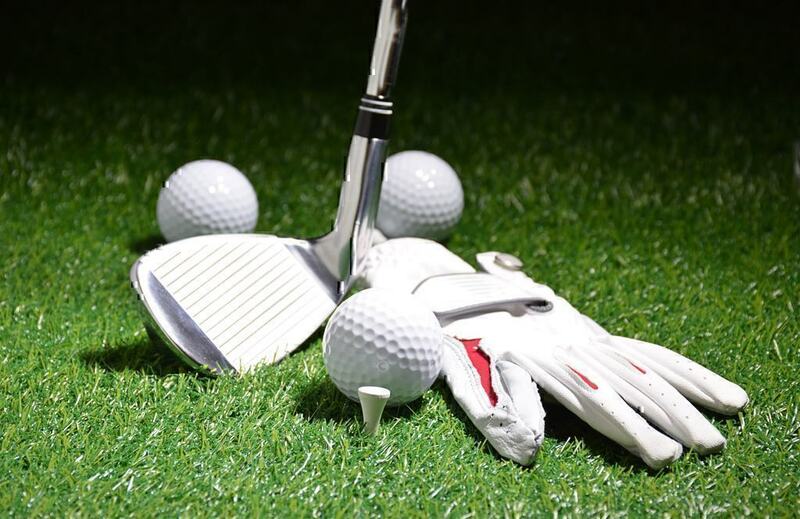 The company's Service Plan, Equipment and Payment Terms also explains that customers that subscribe to any of their plans will be responsible for "all applicable fees." For any additional questions regarding the company cancelation and refund policy, the customers can contact FreedomPop customer support. 4. 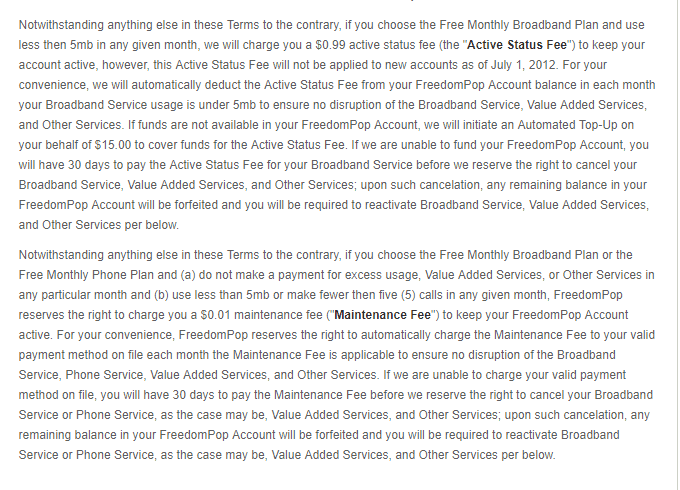 Why am I being charged when I am on the FreedomPop "free" plan? The company’s Support pages explain how some users could face billing issues even though they signed up for FreedomPop's free plan. One instance could be that the customer signed up for a free trial and the trial has ended. 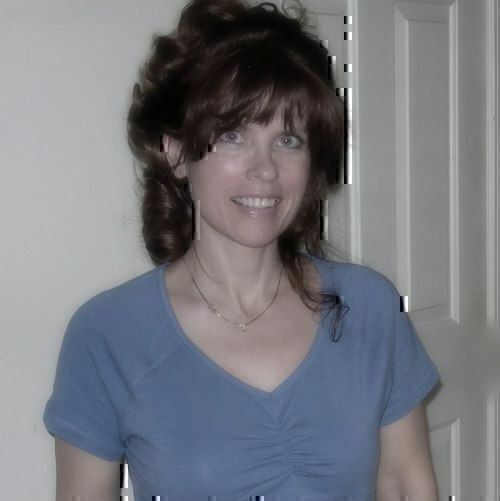 Free trials are sometimes offered, but they are different than free subscription plans. FreedomPop's free trials last one month, after which customers who have not canceled their service will be charged. FreedomPop's "Free Monthly Broadband Plan,” provides customers with 200 MB of broadband data each month at no cost. However, according to the company's terms, customers will be charged a $0.01 maintenance fee to keep their accounts active. In addition, if customers exceed, or even come close to exceeding their data limit, FreedomPop will charge a $20.00 "top up" fee. For example, if a customer is signed up for a 500 MB data plan and uses 401 MB, a "top up" fee will be charged. To avoid additional charges or FreedomPop fees, customers must make sure they downgrade their service before their free trial month ends and monitor their usage closely. 5. How do I stop FreedomPop apps from draining the battery on my phone? Consumers have complained about this issue on Pissed Consumer and FreedomPop. One FreedomPop customer said a phone would only remain charged for two hours. Answers to FreedomPop frequently asked questions found in the forum suggest there could be more than one reason why this problem occurs. One possibility is that the phone’s battery might need to be replaced. Another likelihood might be that the problem is hardware related. 6. How do I stop the Freedom app from using so much mobile data when I’m connected to WiFi? Customers have complained on Pissed Consumer that FreedomPop's app uses mobile data in the background. One consumer wrote that the FreedomPop app was running in the background even when the mobile data option was turned off. In fact, the phone used all of the available data in one day. "…I checked my phone and saw it was running in the background when I turned of data already…So all my month's data gone 50min on the first day of cycle and I no longer able to use my phone…"
According to an answer provided in the FreedomPop forum, customers are urged to make sure certain mobile data are turned off when using WiFi since most devices will automatically switch to mobile data whenever WiFi signals get weak. Also, users should turn off automatic app updates and make sure that no apps are running in the background. 7. 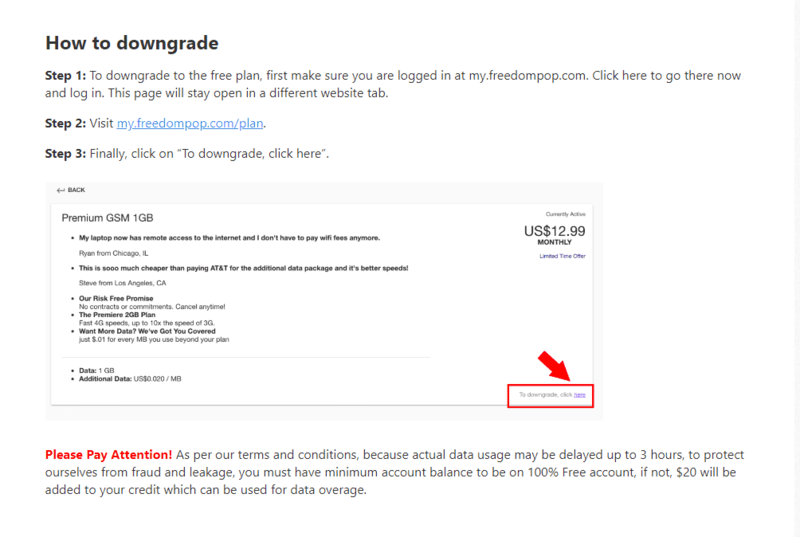 How do I upgrade or downgrade my www.freedompop.com plan, and can I downgrade for free? According to FreedomPop FAQ, users wishing to upgrade their plans should log in to their accounts and click on “Available Plans.” After they are on the plans page, they can select the FreedomPop plan they wish to use. 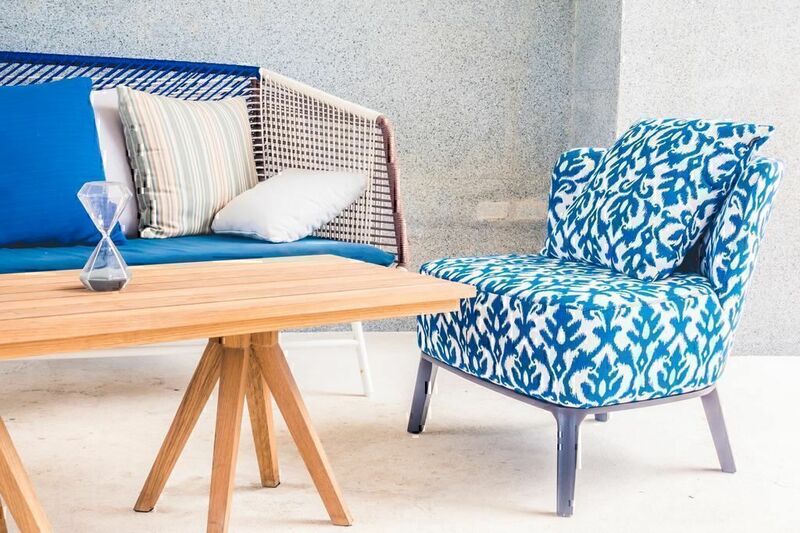 Customers should be aware that the company states that any additional charges will take effect immediately. 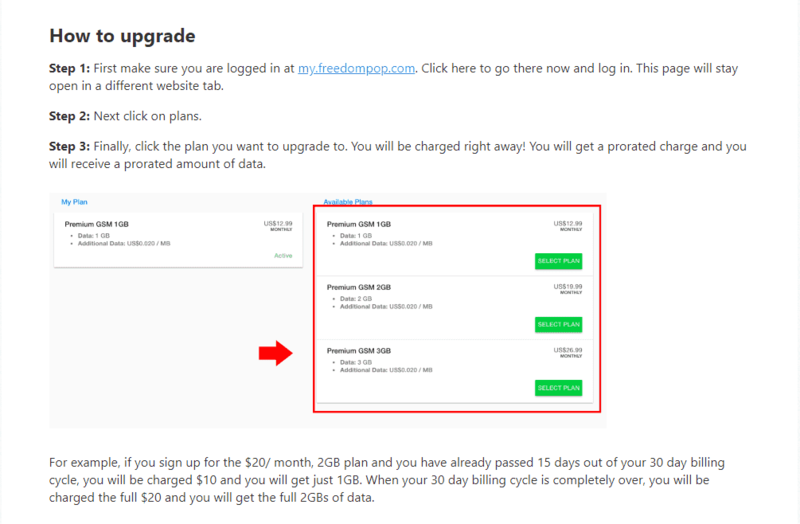 To downgrade for free, FreedomPop's customer help page directs customers to log in to their accounts and click on “plans.” Customers should then click on the “To downgrade, click here” button, which is located on the bottom right of the page. FreedomPop also clarifies that because it can take up to three hours for changes to take effect, customers must "have minimum account balance to be on 100% Free account." If this is not the case, FreedomPop will charge customers $20, which the company claims can be used for data overage. In case the customers have difficulties with upgrading or downgrading of phone plans, they can always reach out to the company via FreedomPop customer helpline. 8. What phones work with FreedomPop? A complete list of phones that work with FreedomPop can be found at this link. 9. How much free data I’m allowed on FreedomPop.com, and what happens once I go over that amount? FreedomPop’s website explains that free plans start at 200 minutes, 500 text messages and 500 MBs for $0.00/month. When customers exceed or come close to exceeding those limits, the company charges $20. For additional FreedomPop customer help, customers can contact the company customer support department. Write a FreedomPop review so that a company representative or other consumers can respond. Read FreedomPop complaints and online reviews on Pissed Consumer to see if your question has been answered. Ask your question in FreedomPop's Q&A section.